…there was Young Indiana Jones.. though technically that follows James Bond Jr. (1991) and R. D. Mascott’s 003½: The Adventures of James Bond Junior (1967), which are technically (again) nephews (though Bond is an only child) and not younger versions of the adult characters like Young Bond or Young Indy. Anyway, Paramount and CBS are finally getting ready to release The Young Indiana Jones Chronicles on DVD come October 23rd in the United States. 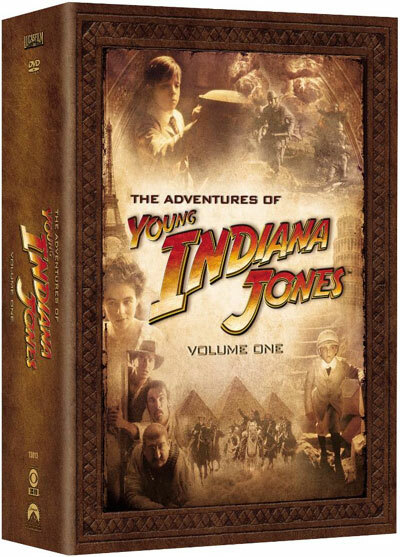 The first release, titled “The Adventures of Young Indiana Jones” and subtitled “Volume 1” is a 12 disc set. I’m not quite sure how many episodes are in the set, but the series ran for 44 episodes (8 of which went unaired) plus documentaries and features that George Lucas has been promising fans for years. In total there will be 3 sets with “Volume 2” following in January 2008 and “Volume 3” sometime around the release of Indiana Jones IV in theaters. 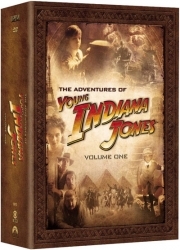 Box art for The Young Indiana Jones Chronicles was recently released and the whole boxset can now be pre-ordered from Amazon.com . While Amazon doesn’t currently list a price, it would appear the set will retail at $117.99. I can’t wait for this. I’ll be buying all three sets. A little expensive, but…it’s Indddyyyy.